The bit of the review by Taylor of interest to us discusses a major point made by LeDoux in his new book: there is a crucial distinction between an emotion in the scientific sense of a particular nonconscious process underpinned by specific neural correlates on the one hand, and the psychological, conscious state of experiencing an emotion on the other hand. This, I maintain, is pretty much the Stoic distinction between “impressions” (which are unavoidable) and “assent” (which is the result of our conscious judgment). To be more specific, LeDoux points out that when scientists talk about, say, fear (which apparently is the major focus of his book, despite the title), they refer to the evolved, presumably adaptive, nonconscious neural system that allows us to detect threats and to react to them. The classical fight-or-flight response is an obvious example, and the neural machinery that makes it possible is in fact located in the amygdala. Now, the amygdala does, of course, create the basis for the conscious feeling of what we call fear, the emotion. But it is important not to confuse the two (as, according to LeDoux, even a number of neuroscientists tend to do): emotions are better understood as “cognitively assembled conscious feelings,” which means that they are the result of an active, conscious, construction of the human mind. This construction takes place out of a number of building blocks, only one of which is the non-conscious, amygdala based, threat detection and reaction mechanism. What are the other components? They are derived by our understanding of the context in which we are experiencing the reaction, including the social context, as well as from our past judgments of similar situations, our expectations about them, and so on. In other words: conscious deliberation arriving at a judgment, the human use of what Marcus Aurelius famously called the ruling faculty. 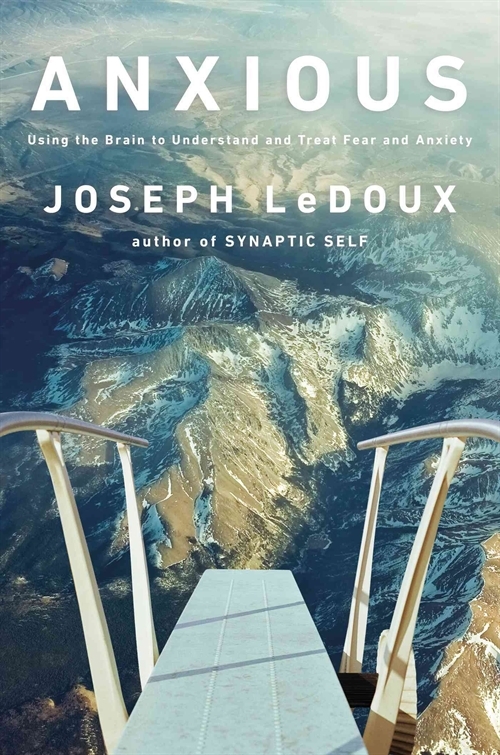 In fact, LeDoux strongly advises us (and his colleagues) to restrict the use of terms like “fear” (or “anxiety”) for the conscious judgment, not to confuse them with the nonconscious reaction system that is only one component of them. Indeed, and it is to the latter question that Stoics addressed themselves: I do perceive a strong, unavoidable, impression of something, but is my voluntary assent to that impression rationally warranted or not? This is no counsel against medication per se (when needed, which is likely much less often that the pharmaceutical companies who benefit from its sales would like us to believe), but it stresses the fact that the human mind and its emotions are a lot more complicated than a series of automatic, machine-like responses to external stimuli. It would appear that Epictetus was right: “So make a practice at once of saying to every strong impression: ‘An impression is all you are, not the source of the impression.’ Then test and assess it with your criteria, but one primarily: ask, ‘Is this something that is, or is not, in my control?’” (Enchiridion 1.5). Current neuroscience agrees, so long as we understand the distinction between the conscious emotions and the nonconscious systems that (partially) make them possible. Interesting, Massimo. You say, “emotions are better understood as “cognitively assembled conscious feelings,” which means that they are the result of an active, conscious, construction of the human mind.” In early Buddhist psychology emotions fall under the aggregate of ‘sankhāras’ often translated ‘volitional formations’. These are understood pretty much exactly as you describe: as cognitively assembled constructions or formations. The word ‘sankhāra’ means ‘put together’. Doug, we keep finding more and more parallels between at the least some versions of Buddhism and Stoicism. It’s a good feeling. Yes! Those ancients were pretty smart, wise folks sometimes. The question I think we have to confront is to what degree emotions/sankhāras are really under conscious control. We ourselves are in a sense constructed out of them, after all! There is no feeling more frustrating or fruitless as telling oneself one shouldn’t be doing this or that while one continues to do this or that. Early Buddhism doesn’t tackle the question of free will at all, and has no notion of weakness of the will, only wrong intention. So from that standpoint it isn’t a matter of ‘will’ per se, only intention and practice. Other question is to what extent these are ‘conscious constructions’ as you put it. My sense is that normally they are sub- or pre-conscious. It is not as though we deliberate about them, rather we find ourselves having constructed them. Part of the point of meditation is to calm the mind down to the extent that one can become more directly aware of these processes as they occur, which ordinarily are so rote and rapid that we are unaware of them as such. subjective feeling of anxiety untouched’. This seems strange. I see clearly that there are unconscious as well as conscious components to emotion, but not that the two are equally involuntary vs. voluntary. Of course one can try to voluntarily suppress a consciously experienced emotion, but if one masters one’s fear, one may literally decrease the (unconscious) production of adrenalin. I see no justification for simply equating fear and anxiety, or generalizing their specific mechanisms to an understanding of emotions at large. I do see that when one is enamored of a theory one wishes to see it everywhere, at the expense of any number of distortions. Thus you with stoicism as I with astrology. You declare that modern science has confirmed Look before you leap, and that Epictetus said that. The observation woulld leave me cold except that it is so characteristically Capricornian, in its austerity, practical caution, scientism and antiquarianism. Indeed. Even though LeDoux’s distinction is a good first approximation, we do know that the amygdala and the frontal cortex are deeply interconnected and in constant communication, so I expect the real picture to be a complicated mess of continuous feedback between the two. The crucial point, however, is that this enables the Stoic (and Buddhist) idea that we can take a rational step back from our instinctive reactions, and over time even mold them via cognitive analysis. That is, after all, the guiding principle of CBT, which does work, empirically. As I have written in the past, the Stoics seem to fit into a compatibilist take on free will, and I really like what Becker has done with that notion in his A New Stoicism. I appreciate your sarcasm, but perhaps I can convince you to entertain a serious discourse for a moment. To begin with, I am not “enamored” of Stoicism. Indeed, I was quite skeptical about it when I first approached it. But I do think it has value, which is why I’m studying it seriously. Moreover, I have pointed out on several occasions a number of things the Stoics got wrong, for instance their teleonomic ideas about the cosmos. But I thought it would be nice to also highlight things they got surprisingly right, or close to right. Stoicism is a philosophy, not a religion (or a pseudoscience, like astrology), which means that it is inherently flexible and can accommodate new scientific discoveries and philosophical insights (up to a point, obviously, beyond which it would make little sense to call it Stoicism). And indeed there is significant evidence that the ancients themselves thought of it that way (Seneca wrote that he was well aware that his generation’s wasn’t the last take on knowledge, that future generations will discover new things that he couldn’t think of). You should read LeDoux: that was *his* point (as a neuroscientist): “emotions” in the neuroscientific sense are involuntary, but in the psychological sense are (at the least partially) voluntary “constructions.” And as I said above, we know that the two interact with each other. What that means is that the drug can calm the involuntary aspect of the emotion, but if you have real worries (loss of job, relationship, or whatever) you will keep feeling psychologically anxious. As my colleague Lou Marinoff, author of Plato, not Prozac! put it: if you are experiencing a chemical imbalance, by all means take Prozac (or whatever) to calm you down. But after you calm down you still have to do some thinking to tackle your problems, and the pill ain’t gonna do the thinking for you. I did not, and neither did LeDoux. I simply said that while the book’s title mentions anxiety the bulk of the treatment is on fear. It doesn’t mean they are one and the same thing. Hi again Massimo, and thanks for your responses. Indeed, although I would say we mold them via long term, repeated practice. That practice may involve cognitive analysis but cognitive analysis is not itself remotely strong enough to do the job on its own. (Thus we may cognitively know right from wrong yet persist in wrong thinking, wrong behavior). I think this is a critical distinction to make particularly in an expressly philosophical context: cognitive understanding alone is never sufficient. Quite so. And I think only a compatibilist take on free will makes sense on an early Buddhist understanding of the mind as well, particularly given the causal picture implied by dependent origination, and the notion that there is no permanent, unchanging soul or self directing action. Nevertheless it is not a topic that’s dealt with to my knowledge in the early suttas. It’s an interesting question as to why not. Doug said: I think this is a critical distinction to make particularly in an expressly philosophical context: cognitive understanding alone is never sufficient. Based on my elementary understanding of Stoicism, I think the ancient Stoics would have agreed. I say that not only because ‘action’ is one of the three Stoic disciplines (and is overtly behavioral in connotation), but also because even the other two – desire and assent – seem to have behavioral dimensions to them (e.g. in the Stoic’s active expression of fate acceptance and in her selective execution of some, not all, urges to act). Presumably, that is also where the ‘B’ in CBT (Cognitive-Behavioral Therapy) comes from…care of founders like Beck and Ellis, who were reportedly inspired by Stoicism, not so unlike the way that Buddhism inspired Kabat-Zinn to develop MBSR (Mindfulness-Based Stress Therapy). Come to think of it, now that Buddhist-inspired mindfulness is a feature of CBT’s “third wave”, these modern clinical trends are no longer so easy to disentangle. On a more personal philosophical note, I find myself drawn towards a synthesis of these traditions (and others that I find helpful, like Pyrrhonism). At a meta-level, I suppose this admission qualifies as an endorsement of pragmatism (not to mention heterodoxy), which is fine by me. I’m with Douglas on this one. I like much in the Stoic approach, but I find the emphasis on the ‘rational’ and ‘cognitive analysis’ aspects inconsistent with what I have found to be effective in overcoming disfunctional emotional repsponse patterns and replacing them with more favorable response patterns at least in my own experience. I am not putting down rational deliberation which has it’s place. My nature is to try to work things out rationality, but this was often ineffective for me sometimes even escalating the negative cycle until I learned how to better access the intertwined conscious & unconscious patterns through applied practice. I don’t think there is some separate ruling rational faculty, and it feels to me Massimo, sometimes as if your language points in that direction. I think sometimes the eastern philosophy that was so useful to me (Taoism) unnecessarily downplays rationality in a similar way that I see some takes on Stoicism overplaying the role. I have no doubt we can do a great deal to cultivate both our conscious and unconscious response patterns so that they help respond to our conditions without unnecessary self created struggles. I just favor a philosophical approach that doesn’t place any single faculty as the ruler in this process. I hear your. Stoicism may be some people’s cup of tea but not others’. Moreover, let’s keep distinct a general philosophy of life (like Stoicism or Buddhism) from specific techniques like CBT or ACT. As for the “ruling faculty,” I don’t think it’s completely distinct, but I do think modern neurobiology supports the idea that there are different executive and emotional centers of the brain. What’s crucial, and the Stoics could not have known, is that these centers are highly interconnected and in continuous reciprocal feedback (which is why CBT works, among other things). As for who should be on top, here I do buy the Stoic (and Socratic) idea that what distinguishes us is the ability to reason, and that other things considered that ought to be our main tool in navigating life. That’s not at all to say that emotions aren’t important, however. About ten years ago I read a book on the studies on memory by a Brazilian (Argentinian born) neurobiologist, Iván Izquierdo. In it I learned that the author could not differentiate between emotion and reason in neurological level, say, there’s no thinking activity that’s not permeated by what we call ’emotions’. Another information came to me a little earlier, in an article on the research of a french group claiming the ‘discovery of subconsciousness’ (in freudian sense) that in short was a kind of model of that concept in those times’ neuroscientific terms (late 1990’s): subconscious activity would be just a part of a phenomenon like an iceberg whose top would correspond to the conscious part of it. I tend to think this way, obvious one, that consciousness is just a part, variable in size, of a complex, huge building of neural activity. I believe that psychoanalysis, meditation, stoic practises etc are attempts to reveal more from this building/iceberg of neural activity, though intense, traumatic experiences are able to do the same. If we think on Epictetus’ concept of innate knowledge, the knowledge of the good, and if we add to it the target of Stoic discipline, which could in short be the avoidance of the worst side of ‘opinions’, we understand that this conception of ‘opinion’ is close enough to that of ‘emotion’ to be taken, in that philosophy, as one and the same – and so ‘reason’ could be taken further as a kind of fabric made with the various emotions’ threads (a very likely model of mind, I think). Epictetus is saying we have effective control over our opinions, although not always resulting in coping with them, thus pointing to the role of the will in constituting emotions. What he’s trying to say, I believe, is that the volition enters this process just – always – to alleviate the emotion’s effects (whenever harmful), even though failing mostly. The will would enter this scenario to fix some consequences of some emotions, unless it fails or the subject is a masochist. So, what’s consciousness in this case? Something that ‘perceives’ something else existing separately, or the sum of all noticeable parts of those ‘neural’ processes? The presence of volition could be hinting at the first option: being guided by the innate knowledge, it’d act as a kind of shield protecting the consciousness from the bad effects of emotions. But being emotions also ‘opinions’, as they are controllable and arise as sorts of judgements after some perception (which, for instance, may be deemed threatening or not, good or bad, at first unconsciously), that points to the second of the choices. And as I mentioned before, it also points to a model of reason as a fabric made of controlled, conscious-made emotions, which are already judgements made even unconsciously on perceived ‘objects’. So, the body itself judges and keeps judging over its own judgements, thus constituting consciousness and reason, all that guided by the innate knowledge of the good.